Considering a visit to Paraguay? Click here for places not to miss. Sneak Peak with Anthony Bourdain Parts Unknown Paraguay – October 3, 2014 – full episode airs next Sunday Oct 12! Green Going Gone: The Tragic Deforestation of the Chaco – July 28, 2014 – An excellent read of Big Agribusiness vs Paraguay’s precious wilderness resources and its people. 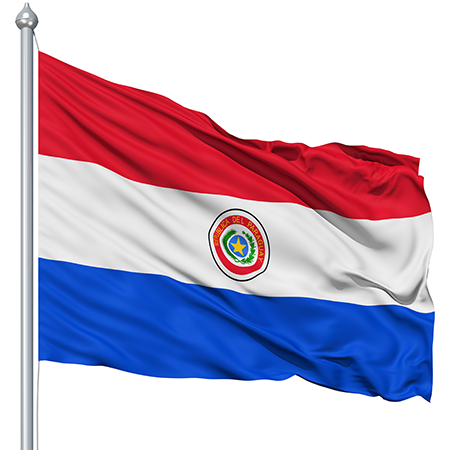 Paraguay, officially the Republic of Paraguay, and known as the “Heart of South America” is a landlocked country in South America, bordered by Argentina to the south and southwest, Brazil to the east and northeast, and Bolivia to the northwest. The history of Paraguay is poorly documented, as almost no archaeological research has been done and little is known of Paraguay‘s pre-Columbian history. What is certain is that the eastern part of the country was occupied by Guaraní peoples for at least 1,000 years before the Spanish colonization of the Americas. Evidence indicates that these indigenous Americans developed a fairly sophisticated semi-nomadic culture consisting of several independent multivillage communities. The first Spaniards settled in the territory in the 16th century. They were predominantly young men, as few women followed them to the region. Following the Spanish conquest and colonization, a large mixed (mestizo) population developed, which spoke the language of their indigenous mothers but adopted much of their fathers’ Spanish culture. Paraguay’s colonial history was one of general calm punctuated by turbulent political events; the country’s economy at the time made made it unimportant to the Spanish crown, and the distance of its capital from other new cities on the South American continent lead to isolation. Paraguay declared its independence from Spain in 1811; since then, the country has had a history of dictatorial governments, from the Utopian regime of José Gaspar Rodríguez de Francia (El Supremo) to the suicidal reign of Francisco Solano López, who nearly devastated the country in warfare against the combined forces of Brazil, Argentina, and Uruguay from 1865 through 1870. The so-called War of the Triple Alliance ended in the near annihilation of Paraguay and set the stage for the formation of a two-party (Colorado vs. Liberal) political system that persists until the present day. Following political turmoil during the first three decades of the 20th century, Paraguay went to war again, this time with Bolivia. 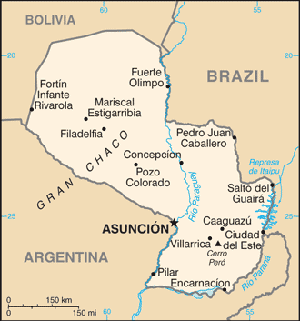 From 1932 to 1935, approximately 30,000 Paraguayans and 65,000 Bolivians died in fighting over possession of the Chaco region. Initiative and creativity were stifled for many years during the rule of a series of dictators. From 1870 to 1954, Paraguay was ruled by 44 different men, 24 of whom were forced from office. In 1954, GeneralAlfredo Stroessner took advantage of the strong link between the armed forces and the Colorado Party to overthrow the government; he ruled until 1989. Although there is little ethnic strife in Paraguay to impede social and economic progress, there is social conflict caused by underemployment and the enormous gap between the rich and the poor. Positive steps to correct these inequities have occurred since the 1989 ousting of the last dictator, and the country’s political system is moving toward a fully functioning democracy. However, the tradition of hierarchical organizational structures and generous rewarding of political favors prevails.